On the eve of the Federal election, WorkLife presents the second in our series of evening talks events. Think what could happen in a world post-partisan politics as we know it? 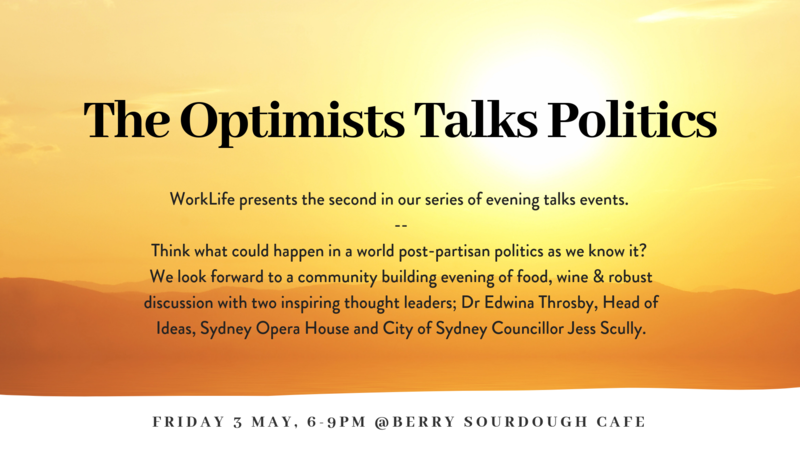 We look forward to a community building evening of food, wine & robust discussion with two inspiring thought leaders; Dr Edwina Throsby, Head of Ideas, Sydney Opera House and City of Sydney Councillor Jess Scully. Ticket price includes talk and a 3 course shared meal and wine on arrival.